Mihret Kebede’s audio and photographic works explore intimacy, transition and contestation of the status quo. In a public space, she offers individuals new shoelaces in exchange for their old ones; questioning our (in)ability to accept change and navigating established systems. 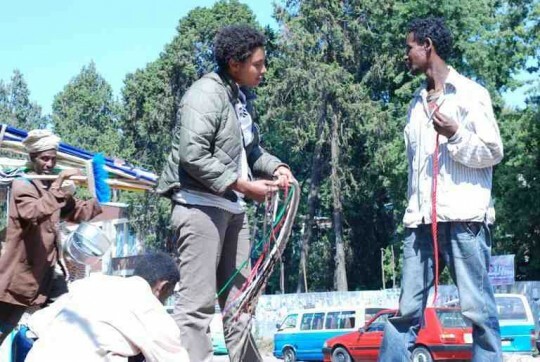 Mihret is Director of Netsa Art Village, Ethiopia, a platform for young artists to network and share experiences. For the past three years she has organised and contributed towards workshops, exhibitions and poetry recitals. Her paintings and installations have been exhibited in Africa and America. She is well known in particular for her radical work in which she utilizes her own menstruation blood for her ongoing diary. For further information, email netsartvillage@gmail.com or mercy_mewi@yahoo.com. Mihret Kebede and the Rhynie Youth Group took part in Slow Marathon 2013.